Started out some premades with a couple of Arathi Basins against another premade. Both games we fought the same team. First game we almost got 5 capped. Second game we did better and barely got 4 capped. 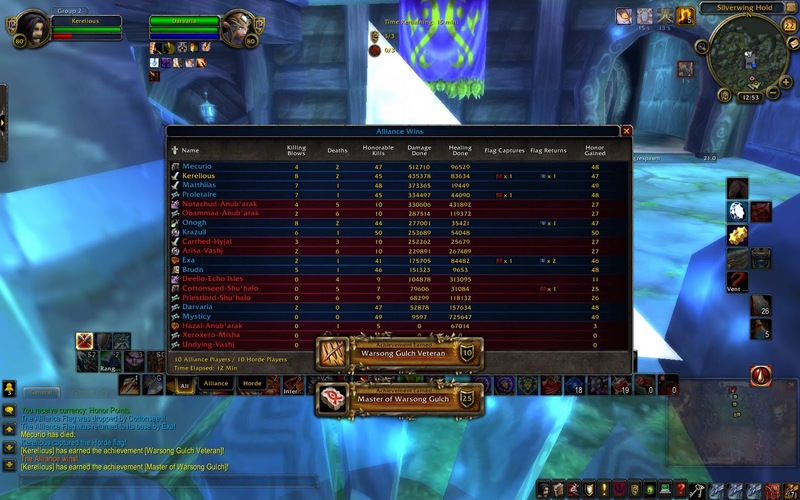 People having to go whittled us down to enough for Warsong and we didn’t lose a single one. Got a lot of achievements done, couple people got Iron Man, and I got my Not so Fast, Warsong Gulch Veteran, which polished off my Master of Warsong Gulch! We tried getting Proletaire his Iron Man a couple times, but he wasn’t able to stay alive. The last team we played was a half premade from our server. He got the first 2 but died just before the 3rd flag was able to be capped. Exa played FC, and he was pretty beast. Barely died at all. Good times. Next story Alterac Valley Blitz!